A trio ofspaceflyers, including one American astronaut and two Russian cosmonauts,blasted off for the International Space Station tonight (Oct. 7) onboard aRussian Soyuz spacecraft. The crewlaunched at 7:10 p.m. EDT (2310 GMT) from Kazakhstan's Baikonur Cosmodrome, soaringspaceward from the same historic launch pad where the first artificialsatellite ? Sputnik ? lifted off 53 years ago this week. 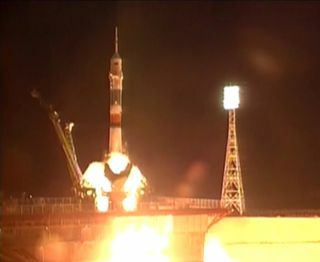 Riding atopthe Soyuz rocket were NASA astronaut Scott Kelly and cosmonauts AlexanderKaleri and Oleg Skripochka. They are flying aboard a new TMA-01M model of theSoyuz spacecraft, which features improved guidance, navigation, control, anddata processing systems, in addition to an improved cooling device for theelectronics. The men arebeginning a months-long mission on the InternationalSpace Station, and will make up half of the station's six-person crew. Kelly, Kaleriand Skripochka are expected to dock at the station's rooftop Poisk module onSaturday at 8:02 p.m. EDT (0002 GMT Sunday), where they will join the orbitingoutpost's Expedition 25 crew ? station commander Doug Wheelock and flightengineer Shannon Walker, both of NASA, and Russian flight engineer FyodorYurchikhin. Kelly ?whose twin brother Mark is also an astronaut ? will assumecommand of the space station in November, when half of the ISS crew willjourney back to Earth. This change will also mark the beginning of Expedition26. "It'sactually the first time that two blood relatives have ever been in spacetogether," Scott Kelly said in a NASA preflight interview. "It'sexciting. I've obviously known my brother a really long time, and we're greatfriends and it's a real privilege to share the experience with someone you'reso close to, the experience of being an astronaut, being able to talk aboutthings that we experience and have a common framework to discuss it." As part oftheir mission, Kelly, Kaleri and Skripochka will participate in scientific experiments and researchin a range of fields, including physics, biology, medicine and geophysics. Theywill also be involved in some educational outreach. Skripochkais making his first spaceflight , but Kelly and Kaleri are both veteran spaceflyers? Kelly flew on two space shuttle missions and Kaleri has traveled into spacefour times before. During theirstay aboard the station, the crew is scheduled to oversee visits from twoshuttles and two unmanned cargo ships ? one from Europe and one from Japan. InNovember, the space shuttle Discovery will fly to the station, followed by theFebruary 2011 flight of Endeavour. The overlapof Endeavour's flight and the Expedition 26 mission means that the Kelly astronaut twins will likely rendezvous in space. Mark Kelly'sshuttle flight is currently the last scheduled shuttle mission, though Congress recently passed abill to approve one more flight before the fleet is retired. "Thespace shuttle program no doubt has been very important in building the [InternationalSpace Station]," Skripochka said in a preflight interview. "It's avery interesting program that demonstrated the capabilities, possibly bothadvantage and disadvantages of a multi-use transportation system. This programhas existed for almost 30 years and it has contributed greatly to thedevelopment of the space research." POLL: Should NASA Retire the SpaceShuttles?